I like the Cap costume. Seems like a good compromise between superhero and soldier. on Thor, even though it’s not a a bad outfit, it feels too modern for a Norse God. I’d prefer an old-style scale mail under a good solid chest plate, and nice golden cape pins instead of all this rubbery, skin-tight stuff… And don’t get me started on those boots…. im a bit disappointed by the thor costume, it looks very bland, and it takes too much influence from the ultimate thor costume which i hate, i better see a winged helmet at some point in the film or i’ll be pissed. the captain america one looks a bit too modern for a movie that takes place mostly in WWII, but i can learn to live with it. Good points Worf. I too like the Cap outfit better, although it looks an awful lot like a Motocross rider with an attitude. Not that that’s a bad thing! And no wings on the helmet per our earlier debate. I agree that makes it less iconic, but it’s still true that even in a world of “Avatar”-level CGI, there is no way to make tiny floppy helmet wings look good on actual people. Clearly, though, the overall direction of the Marvel Movie “look” is driven by the Millar/Hitch Ultimates run. The studio is clearly trying to make sure that all of these guys will work together visually when on-screen in the “Avengers” movie. I still have my doubts about whether or not that’s possible, and the biggest worry comes from Thor. The thing is, Thor isn’t just a guy in a costume. He’s an actual god. Part of what makes the character design you see here work in the comics (this is how he appears in the most recent retcon, essentially) is the imposing bulk of the figure’s upper body and his huge square jaw. The way his tight-fitting metal cap fits over his eyes adds to the whole grim Nordic look. That kind of body doesn’t exist in the real world, though. Putting that costume on a normal guy, even a well built one, just comes off as kind of weak. At the end of the day, I’d say the Thor costume is much more “LA Biker” and much less “Norse God”. I like them both, really; yes, it is a bit rubbery on Thor, but on the other hand, that’s computer-rendered concept art, not a live model, I gather? The actual product may look better, so I’ll wait for official piccies before making more detailed judgment. I can see both costumes as modern incarnations of the heroes. Captain America gearing up with cutting-edge super armor. Thor, being an immortal, “blending in” with the latest superhero look. That being said, neither works if the movies are going to be origin stories. Captain America should have a more WWII pulp comic look. Thor should don periodic Viking armor. Wearing armor was a rarity in and of itself among the Norse. Not just expensive, but we’re talking about the culture that gave us the beserkers! The cape would still work. Sets him apart from mere mortals (ceremonial garb). Spidey had his pajamas, Iron Man had his cave-manufactured body suit. Batman’s costume evolved from combat and surveillance experience. Superman, well, that’s how they actually dressed on his planet. X-Men, the uniform identified them as a team, the movies skipped the solo costumes. Based on these peeks, my expectations are low. Have to wait and see as production moves along. I like the Captain America. I think it’s a good nod to the original costume while not looking silly. Thor… too modern. I think he could look like he just stepped off of the set of The 13th Warrior. Thor looks great from the waist up, but I feel like the pants and black boots are a bit plain. It needs just a little something extra… I like the rest though. The breastplate graphically recalls Thor’s classic costume while resonating with the previous Marvel films (and it looks like the discs will crackle with energy like his ultimate costume!) Plus I love the red piping on the collar. I guess I’m just such a big Thor fanboy that my judgment is a little biased, but I think it looks good. He looks regal, but not antiquated. Cap just doesn’t look right without the wings! YES, the wings look kind of ‘dorky’, but they’re a part of the costume! Thor, I think, looks fine, though if he puts his helmet on, it should have Wings, as well..
because it looks like a beliveable thing for a superhero soldier to wear in ww2 time. and it has the wing drawn onto the helmet which is a good substitute for the actual wings. for the movie cause hes suposed to look like a viking god!! also to add if they want cap to have a modern costume than wait till the Avengers movie to change it cause than hell be in present times!!! I just had a thought, what if thor has two costumes during the film? He could have his more traditional armor before he gets banished from Asgard. I’ve already seen the very brief glimpse of Thor in the Iron Man movie and he is out of armor being photographed. Maybe he gets the armor shown above later on. If that turns out to be the case then i am perfectly fine with this costume. For the record, I can’t remember the site now, but someone involved in the movie reacted to comments on those pics, and said that some of the reason they look all shiny and rubbery is the fact that these are computerized concept pics. According to the guy (yes, I forget who), the real thing will look more like cloth, armor, etc. 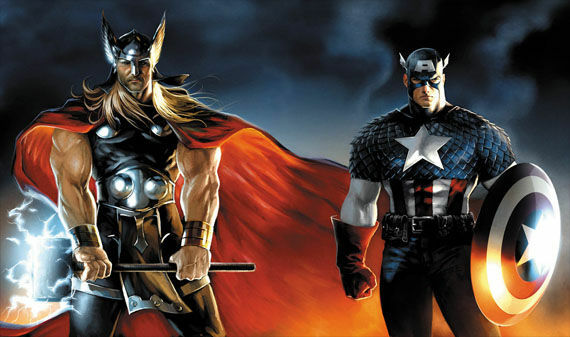 they got the right general idea for cap for his avenger outfit, but that is way too modern for his WWII origin outfit. maybe some actual era-appropriate army fatigues with cap’s colors would be better for his movie, though I think what’s shown is a good concept for avengers. I could swear Thor was in the X-men with his outfit though; that kind of latex-commando pattern does not fit at all. I actually love Thor’s ultimate outfit, but as stated above, it does not translate well onto an actual human’s physique. Im thinking maybe he should wear some actual armor (with the same ultimate Thor design); something that you could picture a god wearing; some fancy Zeus in the clash of the titans remake kind of look. Though, my whole judgement is kind of thrown off with that puny looking mjolnir. I know its a one-handed little block of a hammer, but really… that thing does not project an intimidating godly image. Cap’s costume in the animated Ultimate Avengers, in the opening WWII scenes, should be the template for the early Cap costume. Either that, or he should look like Reb Brown! Thor? Lose the Batman Beyond/Dark Knight influence and get into some good old-fashioned armour, my man.